While production growth in the Chinese steel sector slowed to 3 % in the first half of 2014, the industry is expected to create excess capacity. 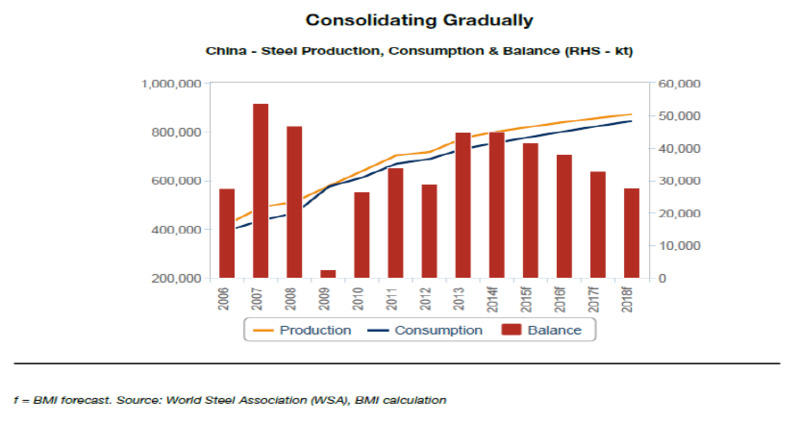 China’s steel sector is looking at a period of slower growth as the rebalancing of the economy gains momentum and moves away from fixed asset investment as the main driver of GDP growth and towards more private consumption. Overcapacity, weak demand, low prices and huge stockpiles remain major challenges for the industry. 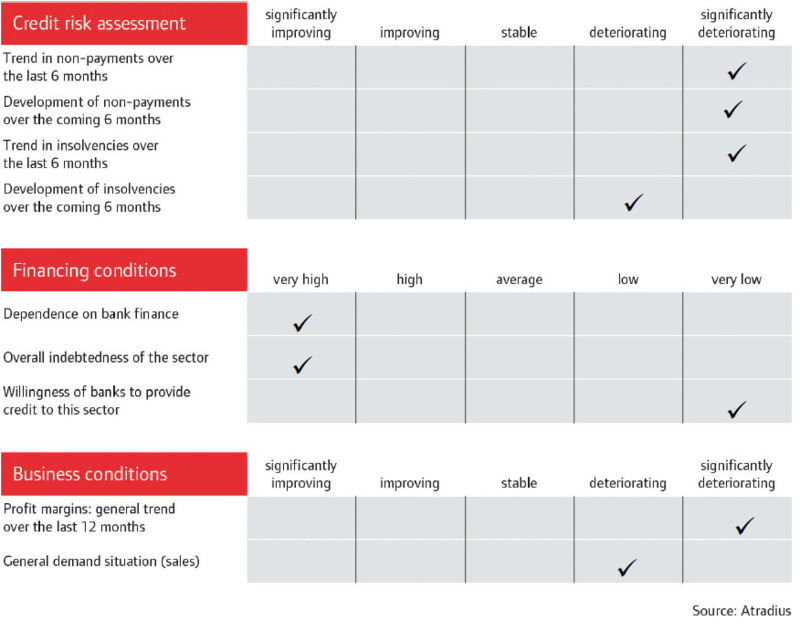 Since Q4 of 2013 banks have pursued a more restrictive loan policy, forcing many private-owned SMEs to close down. China’s government has repeatedly said that it will reduce steel overproduction, but with limited success so far as regional governments have a strong incentive to support local production where possible to maintain employment and prestige. For instance, steel production contributes more than 50% of the local GDP in the Hebei province. Thus, despite several years of pressure from the central government to cut production and encourage industry consolidation, regional governments are still reluctant to take meaningful action. Stimulus policies aimed at boosting economic growth (e.g. infrastructure projects) and falling prices for raw materials such as iron ore have supported high steel production levels. As a result, Chinese steel production continued to grow in 2013, by 7.5% year-on-year, to 779 million tons, compared to an original government target of 750 million tons. While production growth slowed to 3% in the first half of 2014, the industry is expected to create excess capacity of 800 million tons this year, with many products hampered by poor quality. High steel inventories in relation to demand have led to a sharp decrease in steel prices over recent months. While iron ore prices have decreased as mills scramble to maintain their low profit margins, commodity prices have decreased slower than steel prices. 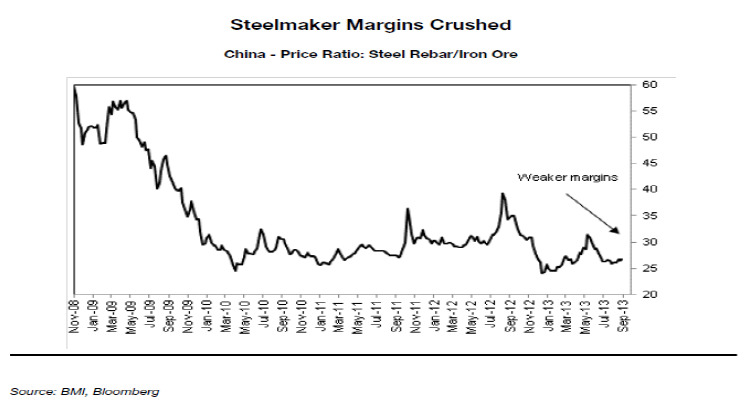 The steel industry’s profitability fell to a new low point in 2013, with average margins as low as 0.5%. In Q1 of 2014 profitability decreased further and in the first two months of 2014 members of China’s Iron and Steel Association (CISA) recorded a collective loss of CNY 2.8 billion (US$ 490 million). For both steel manufacturers and steel traders, bank financing is the major source of funding. According to CISA, 86 of China’s large and medium-sized steel companies accumulated more than CNY 3 trillion (US$ 486.4 billion) in debt by the end of June 2013, with a debt-to-asset ratio of 70%. Of this debt, CNY 1.3 trillion was in outstanding bank loans. The total debt represented 1.67 times the total sales reported by the 86 firms and 1,327 times their total profits. Given those figures and the more adverse operating conditions, many steel businesses are unlikely to repay their bank loans by due date. Since late 2013 Chinese banks have become even more restrictive in granting loans to the steel sector because of growing fears of payment default. According to CISA, the squeeze in bank loans led to a 22.2% year-on-year increase in steelmakers' financial costs in Q1 of 2014. Many steel companies have repeatedly pledged the same collateral for loans from several different banks, thus multiplying the risk. At the same time, loans - especially to steel traders - are being used for purposes other than investment in steel: i.e. to invest in more profitable businesses. Therefore there is a high potential systemic risk for banks, forcing them to cut loans. Disruption of financing could have a domino effect and pose a serious threat to the Chinese economy. The intertwined nature of many credit guarantees in China's steel sector implies that a credit default by a single company could trigger a cascade of bad loans across the industry. Shadow banking is also an issue, as borrowing at high costs threatens borrower´s ability to repay the loan. Meanwhile, local governments are unlikely to provide financial support for the industry, and it is only a matter of time before we can expect many business defaults, especially after the default of Haixin Steel: the largest private steel mill in Shanxi province failed to pay back overdue bank loans in March 2014. With the adverse business conditions, coupled with increased late payments and bad debts over the past 6-9 months, many private-owned businesses - even larger players - are expected to stop production in the next 12 months. We expect a comprehensive consolidation to materialise in the coming years because of falling profit margins, weaker metal prices and the rebalancing of China's economy. Lower prices will continue to squeeze margins and force inefficient producers out of business. That said, state-owned companies already have an important role in the steel industry and will increase their market shares by 2017. Because of the rise in notifications of non-payment in the steel sector that we have received since the end of 2013, we are selective in our underwriting approach, with the exception of the leading steel makers with state-owned background. We meet customers as often as possible and scrutinise the strength of the company, the buyer portfolio as a whole, past claims record and internal credit control. When underwriting a buyer, we assess: shareholder background (state-owned business preferred), local and national position, product portfolio and pollution issues. Financial information obtained from agencies is always at least one year old and is thus insufficient to allow us to accurately assess a buyer’s current financial strength. Therefore we always ask our customers to obtain the most up to date internal financial accounts from their buyers – and, if the potential exposure is high, we will seek an audited annual report with financial notes.